Who We Are - Musketeers Too! Cara Nelson, Granddaughter of Catherine Robbins Clifford, one of the Three Musketeer’s who in 1927 became the first three women to hike the entire Long Trail in Vermont. 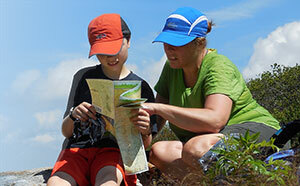 Cara and her 10-year-old son Carl spent their 2013 summer vacation thru hiking as much of the 270 miles of the Long Trail as they could to relive the experiences of their family heritage. Join them as they continue their journey north from the Massachusetts border to Canada on Vermont’s Long Trail. Follow along as they share family historic stories, personal hiking goals and advice for families and individuals to enjoy hiking in the wilderness. Cara and Carl reside in Huntington, Vermont with husband/dad Jonathan Nelson. They wake-up every day, from their home, gazing at the splendor of Vermont’s Long Trail as it traverses over Camel’s Hump, the third highest mountain in Vermont.